Alison Jacques’ West End gallery in London took on the form of an impromptu after-school club yesterday afternoon (12 September) when it was overrun by a multitude of primary school children aged between 4 and 11. The juvenile throng—which included the children of gallery artists Ian Kier, Alessandro Raho, Graham Little and Catherine Yass—had contributed to Painting Can Change the World, an exhibition of more than 100 works being sold by silent auction to raise money for the UK children’s charity Magic Breakfast. The show was the brainchild of Alison Jacques’ altruistic seven-year-old daughter, who had enlisted her schoolmates and her gallerist mother to help less fortunate children get a square meal at the beginning of the day. 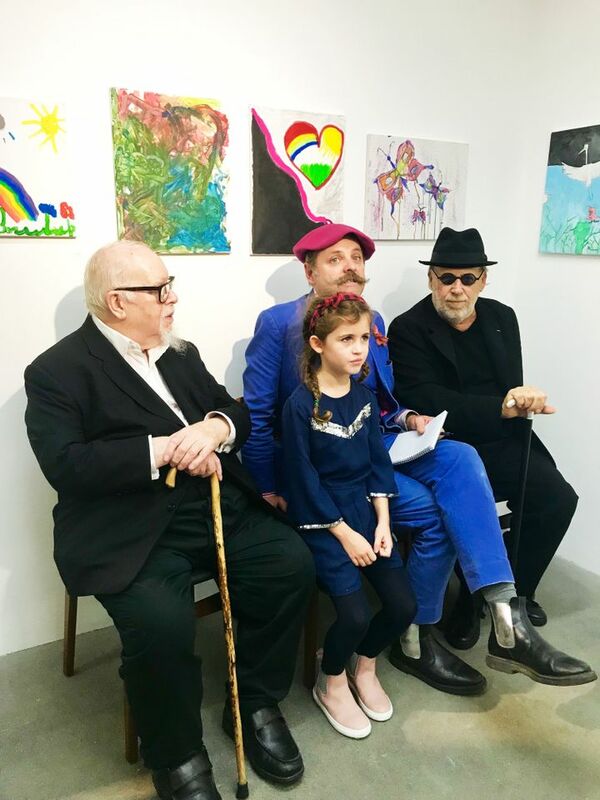 Adding even more clout to the occasion was the presence of a trio of art grandees—Peter Blake, Joseph Kosuth and Gavin Turk—who came in before the opening to select the most promising works in a number of categories that chimed with each artist’s practice, and then stayed on to present the awards. Kosuth picked what he considered to be two of the most conceptually rigorous works, Peter Blake the most pop-inspired painting and most inspired use of collage, and Turk the most interesting self-portrayal and imaginative use of humour. All three combined to choose one piece—a vivid pink haired girl by Year 2 student—to be featured on the official Painting Can Change the World charity t-shirt. Yet the judges were also at pains to be even-handed, with Blake emphasising that “there are no losers, everyone made something wonderful” and Turk praising Jacques for “bringing her job and being a mother into perspective and bringing children into the gallery”. Meanwhile, Kosuth—one of whose choices was a rather pop-ish painting of Campbell’s soup can, was not prepared to compromise his radical stance, declaring that “it’s a bit late for painting” and suggesting that the title of the show and charitable platform should be changed to Art Can Change the World. “The future is female,” he added. For her part, Alison Jacques expressed her belief that, “the art world has become a little too excessive in terms of its entertaining expenses—if we could all do a few less dinners and give a bit more to charity then the world and the art world would be a better place.” Amen to that, but probably little hope of any reining in of gallery budgets in the run up to Frieze week. The works in Painting Can Change the World are on show until 6pm Saturday (15 September) and are for sale by silent auction with bids starting from £25.